Welcome to The Hall of Blue Illumination, a podcast dedicated to the world of M.A.R. Barker’s Tékumel. In this episode, we continue our discussion of the rules system of Empire of the Petal Throne. Our hosts wrap things up with some notes on the Tlokiriqáluyal, the Five “Gods” of Change. [00:00:53] Victor discusses his experience with EPT’s rules set. [00:01:20] The rules of EPT are dense. Professor Barker briefly mentions many rules, and it’s up to you to notice they’re there and parse them. [00:03:55] EPT has a fairly straightforward skill system, which is extraordinary for an RPG produced in 1975. [00:04:39] A genuine issue in EPT is that while the experience points required to advance a level increase with each level (EPT § 6.30, p. 29), you also count fewer and fewer of the points you gain (EPT § 620, p. 29). Victor suggests a solution. [00:09:14] EPT seems to presuppose that after you reach 10th level, a player character becomes involved in the campaign game, and begins influencing Tékumel on a scale beyond that of individual player encounters. [00:12:20] The social group aspect of early gaming communities. [00:14:11] Victor discusses Madison Traditional Gaming, a contemporary association with multiple different groups gaming in different settings and systems. [00:15:58] D&D changed as it spread beyond the communities that originally produced it. People started to game in isolated groups composed of their closest friends, and therefore these groups developed their own peculiar approaches to RPG gaming. [00:19:49] EPT “wants time to grow.” Characters advance not only in terms of personal ability, but also in terms of social rank. A player’s rank results exclusively from their social interaction with the rest of the world. [00:23:54] Scott makes the observation that in D&D, the adventure comes first, and the world after. In EPT, however, this situation is reversed; the setting came first, and the adventure only came later. [00:34:20] Artifacts of a simpler kind of gameplay in EPT do not imply that roleplaying wasn’t going on in ‘70s gaming. [00:37:58] Don’t think of EPT as D&D set on Tékumel. The D&D-esque system is merely a lens through which the world of Tékumel can be viewed. The world is so much more expansive than the rules set. [00:39:41] Pronunciation of the names of the Tlokiriqáluyal (the Five “Gods” of Change). [00:48:51] Pavár’s pantheon is the metric by which Scott measures all pantheons. The Book of Ebon Bindings is fantastic, but currently out-of-print. The 1978 edition was published by Imperium Publishing. Theatre of the Mind Enterprises reprinted it in 1991. Tékumel Journal #2 is available as a PDF from RPGNow. 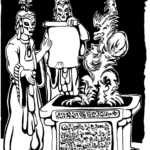 The Lawrence Schick article referenced by Victor is “Choir Practice at the First Church of Lawful Evil (Orthodox): The Ramifications of Alignment.” It appeared in The Dragon #24 (April, 1979). As I download and listen to the episodes offline, I’d be helped a lot if you named the mp3 files something that distinguishes them as being this podcast, in addition to which episode number. If I only see episode-04.mp3 it could be anything. Thanks, I really enjoy your chats about all things Tekumel.